We go through a lot of Smoked Salmon in our family. I think my oldest was two when he walked into a bagel shop and requested lox on his bagel for the first time. 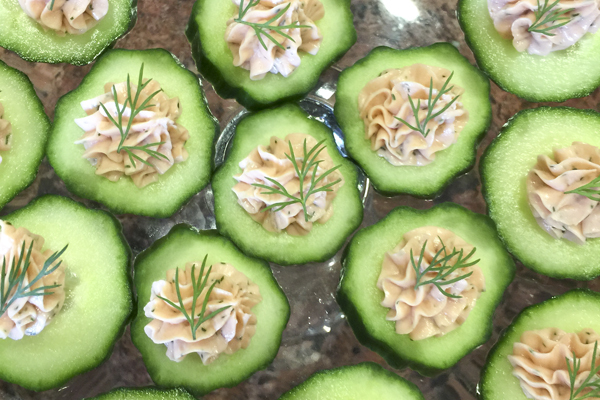 When I was prepping for the Super Bowl a couple of weeks ago, I needed an extra hors d’oeuvre and because we had so much smoked salmon and cream cheese in the refrigerator, I threw together this quick and easy recipe. I almost feel silly posting this because it is so incredibly easy, but then again maybe easy recipes are the best ones to post. I haven’t been great lately about taking pictures of any of my new creations, but I did find a couple of cell phone shots of this one, so I thought I would post them. When I made this for our Super Bowl Party I filled up my dip bowl and used the excess to pipe onto cucumber slices. My younger son consumed an entire large hors d’oeuvres plate of them all by himself. He then had the leftover mousse on his bagel the next morning, so I’d say it was a hit. 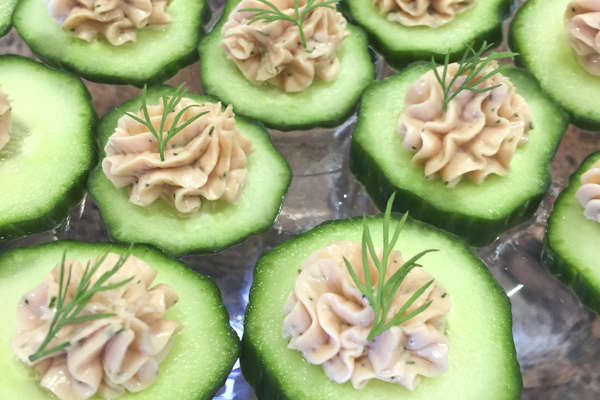 Look how cute these are garnished with little sprigs of dill! The pictures don’t do these justice. They are super easy and everyone loved them. Combine all ingredients into a food processor and process until completely smooth. Serve with crudités, crackers or bread (or just eat it with a spoon… I won’t judge). This is also awesome smeared on a toasted bagel.